Living in Long Beach, we’re fortunate to have a ton of awesome amenities! There are beautiful parks, great public pools during the summer, and an amazing aquarium, all without leaving the city. However, we’ve noticed that if you want to go to a great kids play place, you generally have to take a bit of a drive. And while we love places like Pretend City, we weren’t always up for driving to Irvine. We were at a loss for an easy, local place to visit. That is, until KidzTown opened. So if we’ve been trapped inside after too many rainy days, or just need something special to do on the weekend, we’ve got a great local spot. 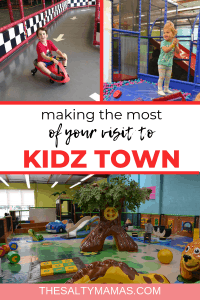 Here are all the tips for visiting Kidz Town you need! Kidz Town is perfect for younger kids starting at age 1. There is no age limit, but there is a 54″ height limit, so make sure to measure up any older (or taller) kids! There is a toddler area for kids 36 months and under, a ball pit (that sparkles it’s so clean! 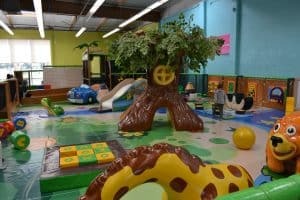 ), a ball shooter area, a rock wall, a Plasma car race track, and a three story play structure that will entertain kids for hours! How much does Kidz Town Cost? When going to Kidz Town, the first adult is free and one child costs $15. Each additional person, whether another child or adult is $7 per person. Infants under 12 months who will be held by a guardian at all times or worn in a carrier will not be charged. All prices are based on a 2-hour consecutive play time. How Can I Save Money at Kidz Town? While we already find Kidz Town to be an affordable activity, The Salty Mamas are always asking how can I save money? Currently, there aren’t any promotions running, however, Kidz Town has announced monthly specials, so make sure you’re following them on social media. That’s how we made sure to notice their $3 off special last February! And we always recommend checking Groupon for deals before heading anywhere! When is the Best Time to Visit Kidz Town? We highly recommend getting to Kidz Town right when it opens. Your admission will get you two hours of play, but if you’re among the first there, you’ll likely get a little longer. Your wristbands are color coded and they won’t ask the first color group to leave until closer to 3 hours after opening. So get the most bang for your buck by being an early bird! Plus, it’s far less busy when it opens – even on the weekends – and picks up as the day goes on! Kidz Town has a no shoes policy, so you’re going to be storing at least your shoes when you visit. Kidz Town doesn’t have lockers, but does have a separate area with cubbies for your belongings. 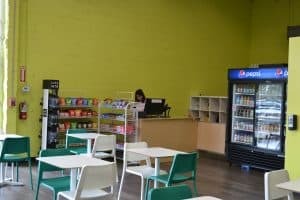 This area is monitored by camera, so while Kidz Town isn’t liable for anything stolen, they are doing their due diligence to keep an eye on things. And you’ll want to set at least your bigger stuff down so that you can play with your kids. 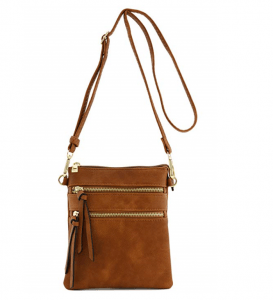 If you want to keep your phone and wallet close, we recommend ditching the diaper bag and keeping a small crossbody on you. Can You Bring Food Into Kidz Town? Kidz Town has a no outdoor food or beverage policy. However, they do have a great little snack shop. You can buy water, milk, Gatorade and a wide variety of snacks from Lunchables to applesauce pouches. Basically everything your kids love, you can grab! You can bring your own water bottle though, and we recommend you do! Make sure to have it full before you arrive as there isn’t a water fountain available. And if your kids are like ours, they’ll get hot – and thirsty – from all the running they’re going to do! Kidz Town has 3 large private bathrooms that can easily fit your whole family. Two of these have changing tables for little ones. As an added bonus, they even have a separate room just for nursing Moms. Just ask the front desk for a key and you can comfortably nurse your baby. Can I Take a Bunch of Kids? One of the big stressors when you have a lot of kids at a play place is keeping an eye on them all. When we go with my kids – 5, 4 and 2 – I can reasonably keep an eye on the youngest and trust that the other two are having a blast. The entry is secure so no kids are going to leave without their adult wearing a matching wristband. Also, the largest structure has one entrance and exit so you can stand there and watch for all your kids without worrying one will slip out another exit. 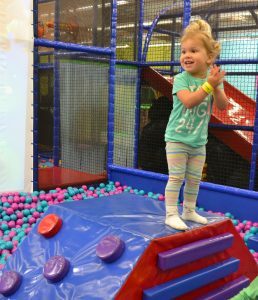 Plus, there’s a great toddler area for kids 36 months and under that is well patrolled and perfect for little ones to play safely. It also has one entrance and exit with a very open floor plan so you can always find your toddler. Does Kidz Town have WiFi? YES! When you get there, make sure to ask the front desk for the password! If your kid is into playing super independently, you can sit on a bench and relax without maxing out your data plan! YES! Remember to bring socks! “Does this place need socks” is always one of the burning questions we ask ourselves before going anywhere with the kids. Also, Kidz Town is geared towards, well, kids! One of the large structures is for kids only, so if your kid is used to having Mom or Dad follow them around, you won’t be allowed past the bottom level. Also, remember that Kidz Town has a strict height limit of 54 inches, so if you’ve got older – or taller – kids, they might need to make different plans. While it’s a bummer when our kids grow out of it, it’s great for when you have little ones that won’t get run down by much larger children. 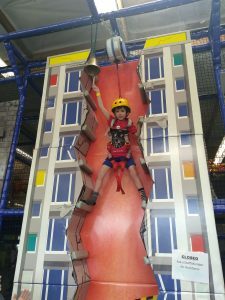 Our kids love Kidz Town because it’s an awesome place to have fun. WE love Kidz Town for a lot of reasons. Their staff is awesome and very hands on. From friendly staffers that run the “rock” climbing wall to employees making sure kids are safe and following the rules, they are great. The entire time we were there someone was cleaning different areas. So unlike some other places, Kidz Town feels clean. They even have two sets of balls for their ball pit to transfer them out to disinfect regularly. And during flu season, this Mama is grateful for the effort! 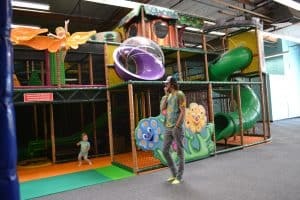 If you’re planning a visit, these tips for visiting Kidz Town with toddlers will be sure to make your visit just a little sweeter. And your kids? Well, they’re just gonna LOVE it. Been there? Drop your kids’ favorite area in the comments!